I bought it one summer, heavy wooden frame and all, about ten years ago in a gift shop in downtown Iowa City, Iowa, at the same time that I purchased for my Department’s library a number of other so-called artifacts, such as the stereotypical dancing Shiva statue and the Thai-styled bust of Buddha, complete with its intricately carved curls. (What a disappointment when people learn I got these in Iowa City!) I never anticipated writing about my framed piece of sedimentary rock that, for whatever reason, has found a home among the Cs in my shelving taxonomy (yes, I shelve books by author’s surname, so? ), though I have often used it in classes to illustrate a point or two about discourses on origins; I now realize that this rock might have some uses outside of the classroom. That I placed the word fossil in quotations marks the first time I used it, just above, should signal what I do with it in classes: I use it to prompt students to consider where originality and antiquity reside—is it a quality that, akin to the formation of sedimentary rock, somehow accumulates within objects over time, layer by epochal layer, or, instead, is it a product of the habit of speech and the styles of behavior (in a word, discourses) that we employ, always in the present, to identify things as young or as old? I admit that as soon as one looks at the empty stare of this boney little fish’s burnt orange-colored skeleton, laying outstretched in two dimensions, having become virtually one with the yellowed rock, you can’t help but see it as a fossil (unless you’re among those, notably in the U.S., who consider evolutionary theory to be an ungodly hoax, then you see it in an entirely different manner, of course—nicely illustrating my point, perhaps? ), and thus as something that is very, very, very old. there routinely come immediate and confident replies from my students, spanning millions to tens of millions of years. But then I observe that this ancient object is actually in their own hands, at this very moment, making it necessarily contemporaneous with them—for if we can see it and feel it, then it is in the present and no matter how hard we stare at it (somewhat like an old-school literary critic giving a text a “close reading” so as to recover the long departed author’s original meaning), I’m not sure we’re doing any time traveling. So with this point established (whether or not I’ve yet convinced them…) we end up talking about not how old it is but, rather, how we know that it is old! That it has yellowed is often a key marker. Sometimes I’ll then talk about how, in grade school and with the help of our parents, we either used to soak our purposefully tattered drawings (tearing the edges and crumpling them, because we all know that old things are in rough shape and wrinkled, right?) briefly in tea or spread butter on them and then lightly bake them on low heat in the oven, like roasting cherry tomatoes, to make them “look” old. (Curiously, the new-looking paper that went into the tea or the oven turns out to be older than the old-looking paper that freshly came out some minutes later, but, as children, we overlooked that, of course. But can we afford to overlook this effect as scholars?) Probably this all convinces no one of anything much in my classes, for our confidence in the depth of the past and our ability to plumb it, as careful historians, is pretty sure. But thinking for a moment about how it is that we know something to be old certainly makes students pause and think—and that’s what this brief exercise is all about: practicing the sort of self-reflection that Jonathan Z. Smith once suggested was a scholar’s “primary expertise” (Imagining Religion : xi). And it usually works, for when I re-pose that question that had once seemed so simple—“How old is that?”—students are not nearly so quick to answer. For they’ve shifted their attention from the self-evidently old thing to their possible role, despite seeming to be passive observers, in actively producing the evidence itself, by means of their presumptions about this foreign land called “the past” where yellowed and tattered origins are thought to reside. This is an excerpt from the Introduction to the multi-author collection, Fabricating Origins, soon due to be submitted to the press for publication in 2015. 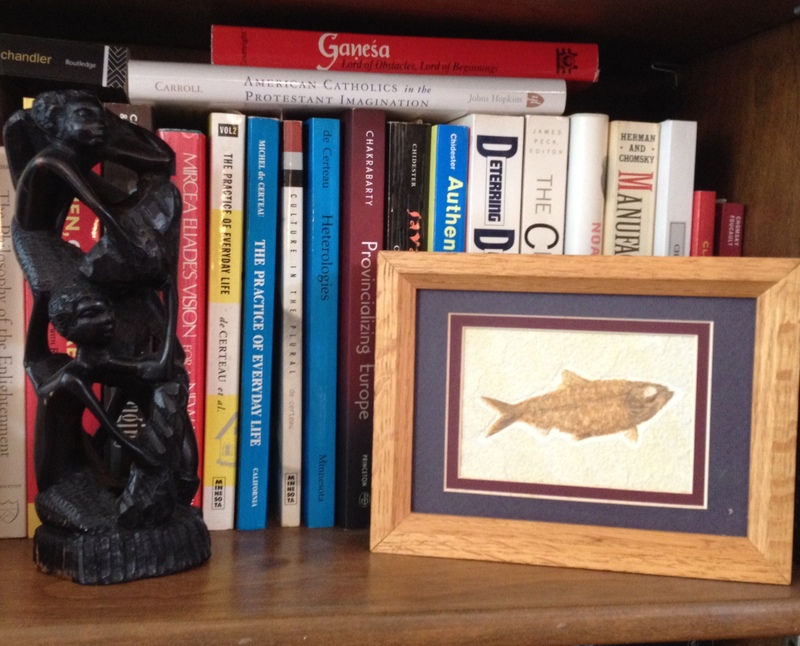 This entry was posted in Faculty Blog, Religion in Culture and tagged Age, Antiquity, Assumptions, Discourse, Fossil, History, Origins, The Past by Russell McCutcheon. Bookmark the permalink.